The temperature this morning was in the low teens with winds making it far colder. It was also snowing which surprised me a little since I've always thought it couldn't snow when the temperature dropped much below freezing. Adding to this was the 4:00 AM darkness creating the most inhospitable running environment that can be found in suburban NY. There was no question that I would run on the treadmill as the darkness alone is enough to keep me inside on weekday mornings. Also, I like the treadmill for reasons I'll address further into this post. As a re-engaged runner I am interested in what more experienced runners think and what they do. I'm always curious to hear real runner's opinions about treadmills because I've found them to be a divisive subject. There are those who just hate them and won't use them unless every alternative is exhausted. I know a person who runs in every kind of weather and who won't even wear a hat or long pants unless the temperature drops below 10 degrees. A couple of friends that are well established runners avoid the treadmill because they think the motion of the tread throws off their technique. I respect them very much and I've learned greatly from them both but I don't agree with that perspective. The treadmill makes great sense to me because it's a practical and enabling technology. It lets me run when nature doesn't cooperate. Perhaps more importantly, the treadmill gives me full control of my environment in terms of conditions, speed and effort. I often think about the movie "2001: A Space Odyssey" where Keir Dullea runs within a space station as it revolves. This morning I realized that I would run out of time before hitting my minimum distance for my weekday run. I had about five minutes left and saw that I was about 3/10ths of a mile short of my goal. With reckless abandon I pushed the speed control to 7.8 mph which is close to a 7:30/mi pace. I ended up covering much more distance than originally planned. I know it's not the same as the street or track but that doesn't mean it's worse. 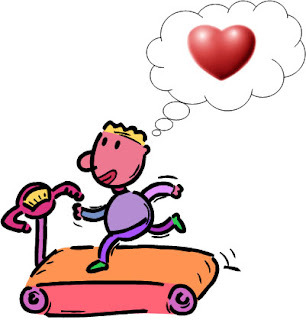 One established runner I know tells me she finds the treadmill workout harder than the street. I know it's not ideal and will always prefer the view of the neighborhood, the athletic field or (I'm guessing) the trail to the static view of my backyard viewed through the guestroom window. But at 4:00 AM with snow and a freezing wind-chill I'm still running. Glad I found you! I started back in September. It's nice to be able to read someone who is following close to the same progression. Will be "stalking" you for inspiration! Caroline - Thanks for your post. Where are you on progress since Sept? What are your 2009 running goals? Good question! I'll drop you an email when I can put some thought into it.